Royal William Yard is a spectacular waterfront destination in Plymouth, packed with restaurants, businesses and unique apartments which are full of character. 2013 saw the University's finance and sustainability directorate move to the yard's New Cooperage building, joining the fine art department who have called the historic waterfront site 'home' since 2008. The ex-navy victualing yard continues to develop as a hotspot of culture at the heart of the local community. The Yard is based in the Stonehouse region of Plymouth at the end of Durnford Street. The yard covers 18 acres and has three postcodes; PL1 3QQ, PL1 3GD and PL1 3RP. It takes about 30–35 mins to walk from the University of Plymouth. Find out more about walking to Royal William Yard at the Urbansplash website. Parking is £1 per hour, paid for when you leave the Yard. 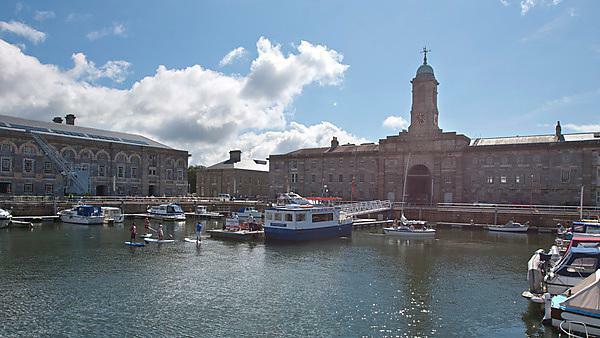 Read more about Royal William Yard Parking. You can get the RWY ferry from the new pontoon from the Barbican. Read more about the Royal William Yard ferry. View the Mills Bakery ground floor access guide on AccessAble. View the Mills Bakery first floor access guide on AccessAble.